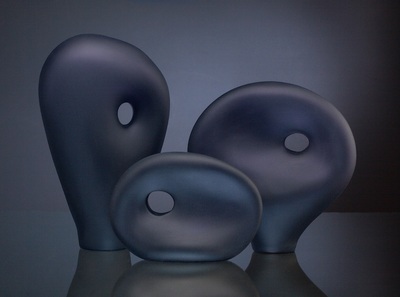 Bernard Katz employs a wide range of techniques in his blown glass sculpture. He frequently references objects found in the natural world. In recent years, Katz ‘s artwork has transformed from utilitarian vessels to more sculptural forms that references a “communication” between and within the forms. The Melange Series of work is a prime example of using the positive and negative space to create the “communication” between the forms. 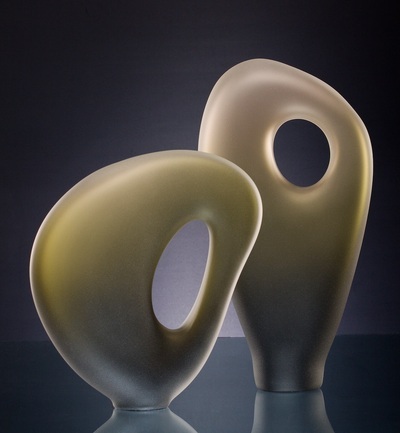 The sculptural series that includes the Trans Bolinas, Grand Serenoa, Vilano, Caladesi and Trans Terra Ceia combines a sandblasted layer of transparent areas to diffuse ambient light for a soft glow, creating a dynamic contrast within the glass. An American glassblower, artist, and sculptor, Bernard Katz has established a dynamic yet distinct style that can be seen in the top art galleries and private collections the world over – including the United States, Canada, Hong Kong, Saudi Arabia, Turkey, Great Britain, and Kenya – among the collection of 2004 Nobel Peace Prize winner, Wangari Maathai. Bernard has been the subject of interest in numerous books and magazines which have featured the artist, as shown in World Art Glass Quarterly Fall 2006. He has exhibited in the top art shows in the United States including The Smithsonian Craft Show, Philadelphia Museum of Art Craft Show, Long’s Park Art & Craft Festival, and the Baltimore American Craft Council Show. Working in hot glass for over 20 years, Bernard graduated from Temple University’s Tyler School of Art specializing in glass blowing and sculpture in 1989. He also attended the West Surrey College of Art & Design in Farnham, England. 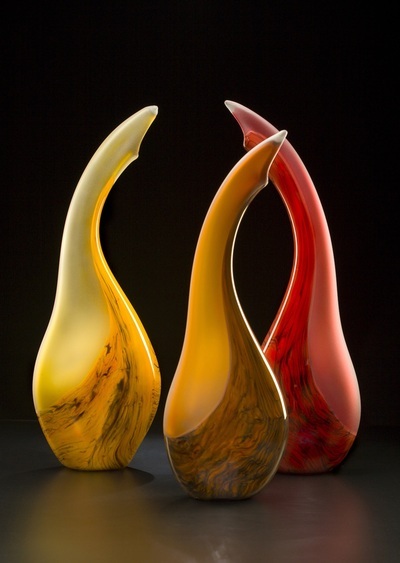 Following graduation, Bernard began working in glass studios around the United States with well known glass artists such as Leon Applebaum, David Garcia and Samuel Bloom before setting out on his own. In 1993, Bernard Katz established his glass studio which is currently located the historic section of Manayunk in Philadelphia PA.